I’ve spent a few inches of words on this blog in the past about my views on “global warming” and “climate change” (or whatever term is en vogue right now) from time to time, so I won’t re-hash any of what I’ve said before … or I’ll TRY not to,at least. But today (22 Apr 15) is “Earth Day” and I’m surrounded right now by people who take the day seriously andbooths in the courtyard outside of my office manned byorganizations which make a living off of rallying support for environmentalism and environmental issues. So I simply HAVEto bring up some of my thoughts. 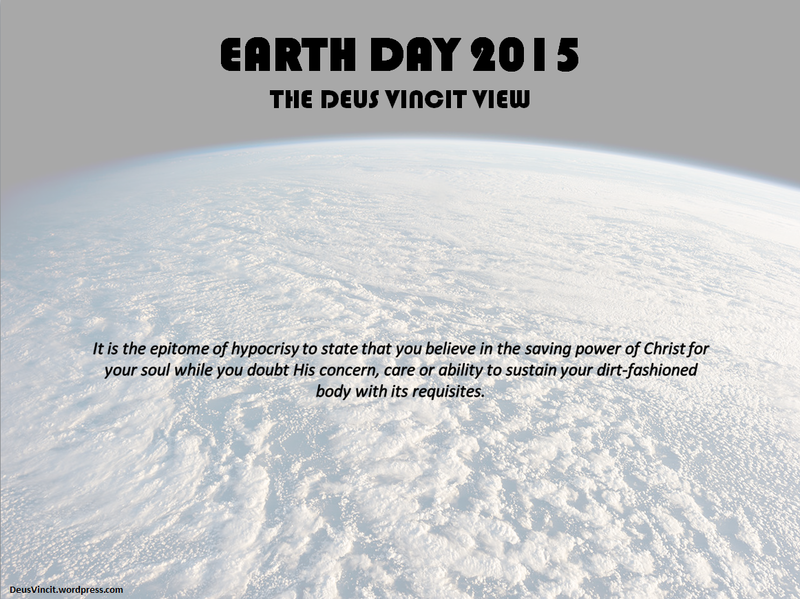 And that’s where “Earth Day” falls in my estimation: a day like any other. It’s a day to praise God for His handiwork and a day to pray that His returning is prepared for by as many souls as possible. To me, what “Earth Day” is certainly NOT is a day on which I put the earth and created things above the regal majesty of the Great King and Originator of it all. And it certainly is NOT a day on which I subordinate myself to the earth which God created for me to enjoy, utilize and “subdue” (His word, not mine – see Gen 1:28). In other words, I find it repugnant when people advocate that the lives of an animal, insect or tree is of more value than a human. I find it disgusting when the land God created for us to “subdue” is cut off by earth worshippers and social-engineers. And I find it revolting when the standard of living for millions of people is degraded for the purpose of slowing the use of natural resources in order to assuage some ill-founded panic by the Chicken Littles of the world. I really do want to be clear about one very important thing: it is disgusting to see the beauty of the natural world destroyed in a wanton and reckless manner. We shouldn’t kill, strip or cut down without reason. That is disrespectful to God as the Creator and Sustainer of all things (Col 1:16f; Heb 1:3; 1 Cor8:6). But going in the opposite direction leads, and has led, to an unhealthy swing theologically: worship of the created rather than the Creator. The pundits and apologists for the new Gaia worship all say the same thing: that the “science” is settled; things are changing and it’s our fault. But the numbers keep proving them wrong (we’ve had 17 straight years without an increase in temperatures, the Antarctic ice cap is larger than it has been in decades and the polar bear population is skyrocketing) in spite of exponential growth in fossil fuel emissions by industrializing countries which far outstrips any of the costly adjustments undertaken by suicidal western emissions-capping protocols. Meanwhile we keep discovering new ways in which the earth naturally restores its own balance, in hydrological, atmospherical and biological ways … almost as if it was designed by an omniscient and omnipotent being. And that is the point, isn’t it? If God IS omniscient and omnipotent, and if He DID create the world and all that is within it, why is it surprising to us that it all works so well? Why is it surprising to us that a Creator who exists outside of the boundaries of time, would be un-stymied by the effects of the natural laws He put into effect? And WHY do we think that a God with such attention to detail that He placed the tilt of the earth, the speed of its rotation and the distance of its orbit from the sun at such intricate and perfect levels for sustainment of life, would neglect then to keep it functioning for as long as it is of service to Him? I have to be perfectly honest with you. I have a very difficult time believing that a Christian can trust and honor God to bring them eternal salvation, but not sustain them in the most basic ways. Jesus called your attention to the sparrows and lilies, but He didn’t have to stop there. It is God whosustains the Redwoods, not the National Parks Service. It is God who makes the Elk herds of the north endure, not the American and Canadian governments through hunting limitations. It is God who cares for the Tapir in South America in spite of hungry jaguars, anacondas and Caiman – not some collection of Amazonian tribes out of reverence to a weird Tapir-god. Everything that lives does so at the pleasure of the Almighty King. It is a rebellion of pitiful value and ultimate disgrace to replace an Almighty King with a fragile, brittle and helpless earthen goddess. And it is the epitome of hypocrisy to state that you believe in the saving power of Christ for your soul while you doubt His concern, care or ability to sustain your dirt-fashioned body with its requisites. If you are a Christian and yet participate in this revolting philosophy, I call on you now to turn from your despicable Gaia worship. Take new hope and new joy in the salvation of God through His Son Jesus Christ, and put aside useless sacrifice to the creation while neglecting and undermining the Creator of itall. We don’t know when He will return, but we do know that He will … and that this earth will be waiting for its renewal in the fire and water of His righteous judgment at that time.